August 20, 2012 By Eugene Nielsen & filed under All Articles, Other Tactics & Training, Tactics/Training. An active-shooter/critical-incident response bag, vest or plate carrier is an essential piece of kit for every peace officer and armed security professional. When shots are being fired, there’s only time to grab and go. A “go bag” is the simplest, most versatile and cost-effective choice. 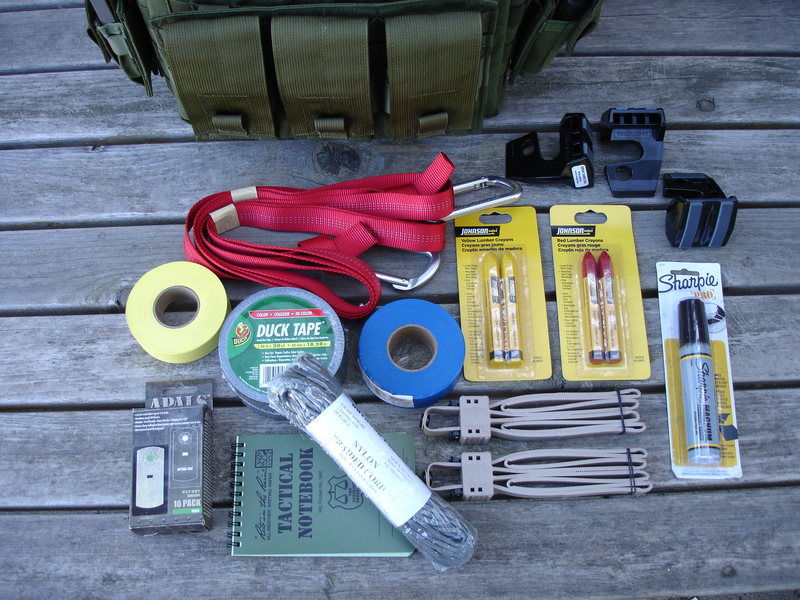 Although this article deals primarily with the needs of the officer on the street, a go bag is a good idea for any preparedness-minded individual. Although a number of companies sell fully kitted active-shooter response bags, putting together your own will save you money. Your needs will depend on what you regularly carry, your agency’s policies, and the types of threats you may be expected to encounter. Keep in mind that active-shooter situations are fast moving and typically end quickly. You don’t want to burden yourself with unnecessary equipment that will only slow your response. An Immediate Action Rapid Deployment (IARD) has two successive phases: 1) active or dynamic phase to neutralize the threat and 2) slow and deliberate phase to clear rooms and render aid. A go bag needs to be kitted out to handle both phases. Specter Gear Modular Bail Out Bag is designed to allow you to custom tailor a go bag to meet your specific operational needs. Author also employs Specter Gear Double Universal Pistol Mag Pouch, Rifle/Carbine/SMG Triple Universal Mag Pouch, Rapid Release Individual First Aid Pouch, and SureFire 6P/G2 Light Pouch. The heart of a go bag is obviously the bag. After looking at what‘s available, I settled on Specter Gear’s Modular Bail Out Bag and Modular Gear as the best for my needs. The design, quality and workmanship on Specter products is first tier. All Specter products are made in the USA and backed by a lifetime warranty. You can’t do better than that. The Specter Modular Bail Out Bag and Modular Gear are ruggedly constructed of 1000D Cordura® and available in Black, OD, Coyote Tan, Foliage Green, Army ACU Camo, Multi-Cam® and USAF ABU Camo. All lining is 520D pack-cloth. Zippers are heavy duty and have quiet-opening zipper pulls. All bar-tack points are reinforced with either two layers of Cordura or heavy-duty ballistic nylon. 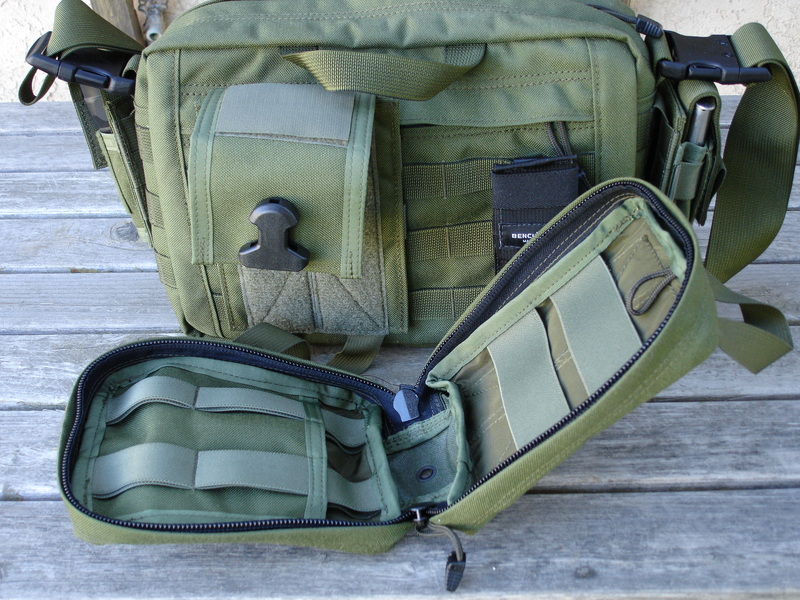 The Specter Modular Bail Out Bag is large enough to hold all essential gear, but not so large as to be unwieldy. PALS webbing is on all sides and there’s a zipper compartment on the body side panel. You can, of course, use any MOLLE/PALS-compatible pouch. The inside of the bag also has PALS webbing and an additional mesh pouch and zippered compartment. The bottom on the bag has drainage hole grommets. The shoulder strap is easily detachable and has a removable shoulder pad. Heavy-duty side-release buckles allow you to quickly break away from the bag. A “grab and go” handle on the body of the bag folds out of the way when not in use. 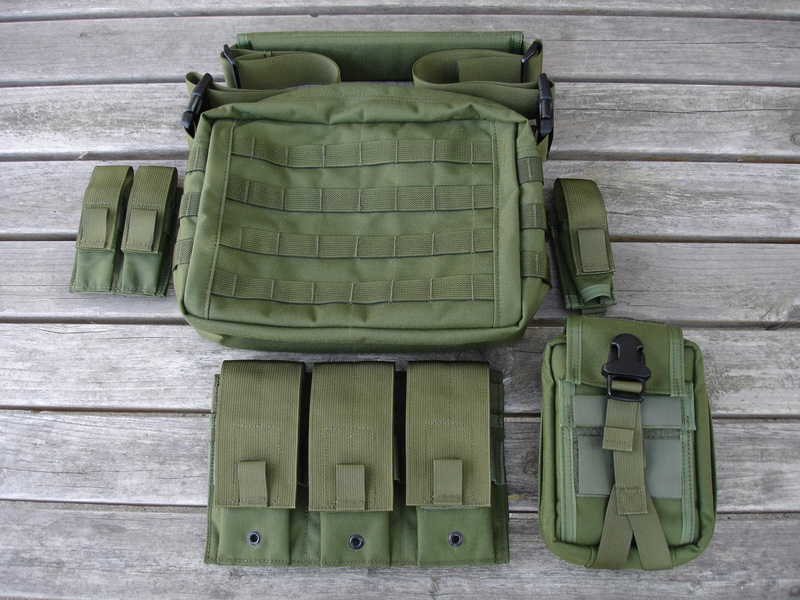 Specter Gear MOLLE/PALS Compatible Modular Triple Universal Rifle/Carbine/SMG Mag Pouch holds six 5.56mm magazines, three 7.62x51mm magazines, three AK magazines, or six 9mm SMG magazines. In an IARD, the only ammo you’ll have is what you carry. I believe in the adage that one can never have too much ammo. 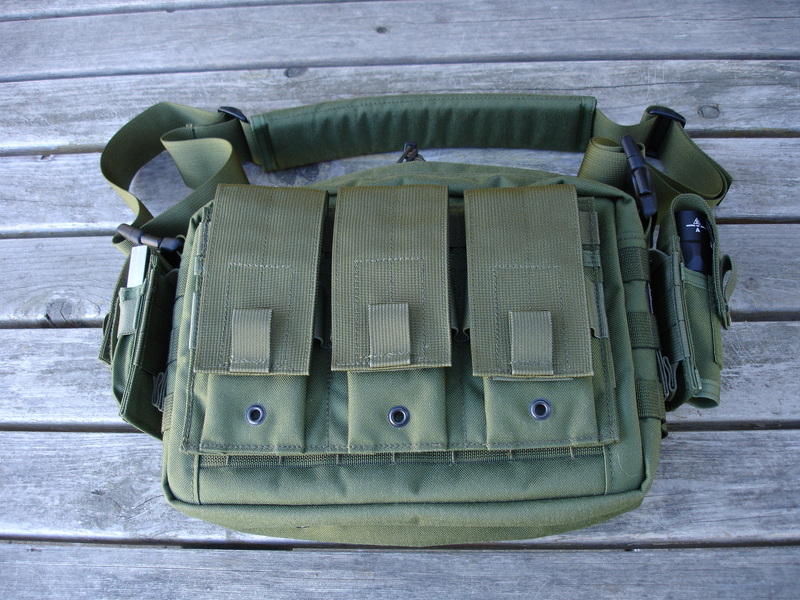 I went with the Specter Gear MOLLE/PALS Compatible Modular Triple Universal Rifle/Carbine/SMG Mag Pouch mounted on the front of the bag. It’s ideal for users who deploy multiple weapon platforms. It will handle six 30-round 5.56mm magazines, three 20-round 7.62x51mm magazines, three 30-round 7.62x39mm magazines, or six 30-round 9mm SMG magazines. I mounted a Specter MOLLE/PALS Compatible Modular Double Universal Pistol Magazine Pouch on one side of my bag. It fits both single- and double-column pistol mags. A Specter SureFire 6P/G2 Light Pouch is on the other side of my bag. In it is SureFire’s superb 200-lumen G2X Tactical LED flashlight. The G2X features a Nitrolon® body, aluminum bezel and micro-textured reflector. It offers SureFire performance at a great price. On the back of the bag is a Specter Rapid Release Individual First Aid Kit (IFAK) Pouch. It features a base panel that mounts to the PALS webbing and a removable first-aid pouch that attaches to the base panel with Velcro for primary retention and a buckle release for secondary retention. This set up allows you to quickly remove the first-aid pouch when needed to render first aid. 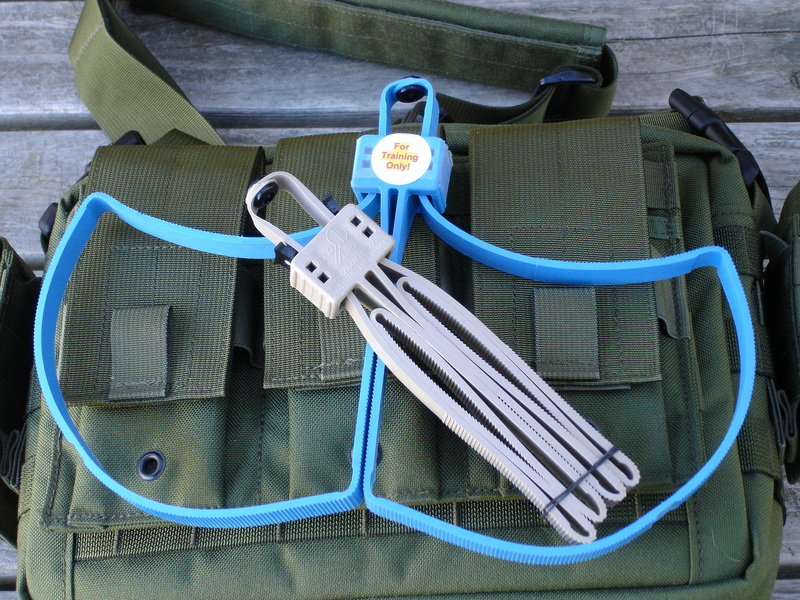 The first-aid pouch features multiple pockets, paracord loops, and elastic straps. Specter Gear Rapid Release First Aid Pouch allows you to securely carry your IFAK on your modular carrier yet quickly remove the entire pouch when needed to render first aid. Treating casualties under fire is part of the overall tactical problem. If you don’t have an IFAK with you, there won’t be one there when you need it. Although your level of training/skill set will largely determine what medical gear is needed in the IFAK, there are a few basics. Bleeding out from an extremity injury is a major cause of preventable battlefield deaths. A effective tourniquet suitable for one-handed application is mandatory. Many tourniquets on the market have not been proven to be effective in independent studies. The Composite Resources Combat Application Tourniquet (C-A-T), H&H Associates TK4 and TK4L, and Tac Med Solutions SOFT-T are among the tourniquets that have been proven effective. I have a C-A-T, TK4 and TK4L in my IFAK. The C-A-T is standard issue with the U.S. Army and Marine Corps, as well as the British Army and SAS. Most operators are familiar with it, so there’s no learning curve. Developed by the Army’s Institute of Surgical Research, the C-A-T is a compact, lightweight windlass tourniquet. The TK4 and TK4L are standard issue with the U.S. Navy and are stretch-retention tourniquets. They’re quick to apply and the smallest, lightest and most cost-effective tourniquets on the market. Both the TK4 and TK4L are manufactured with a newly developed textile that’s virtually unbreakable. Trauma/first aid supplies are essential. Bleeding out and tension pneumothorax are major causes of preventable battlefield deaths, followed by airway obstruction. Hemostatic gauze, such as HemCon GuardaCare® or Z-Medica QuikClot® Combat Gauze®, is needed in every IFAK to treat life-threatening bleeding in areas that are not amenable to application of a tourniquet. I opted for GuardaCare, the pre-hospital/LE branded version of the chitosan-based ChitoGauze®. ChitoGauze is used by the military and has inherent anti-bacterial properties against a wide range of pathogens. GuardaCare offers the same performance but in a lower profile, more compact package, ideal for a go bag. A compression bandage should also be included. I have an H&H Associates Cinch Tight® Universal Trauma Bandage, a one-handed compression bandage that’s fielded by U.S. Special Forces. A couple packages of H&H Compressed Gauze are also included in my IFAK. Penetrating chest wounds are another major cause of death on the battlefield. According to some studies, they’re the major cause of preventable police officer deaths. A patient with a penetrating chest wall trauma will generally have some degree of tension pneumothorax (air in the pleural space). It’s typically slow developing, but can develop rapidly. Open chest wounds require immediate application of an occlusive dressing. It’s a do-or-die situation. I always keep an H&H Bolin Chest Seal® (BCS®) and H&H Wound Seals® in my IFAK for this purpose. The BCS features a patented failure-proof three-valve design and ultra-strong pressure adhesive. The Wound Seal is employed for penetrating chest injuries, chest exit wounds, and multiple wounds in conjunction with the BCS. Treating tension pneumothorax is typically not feasible in a care-under-fire situation. That said, if you have the training and authorization, you may wish to include an appropriate angiocath, such as the H&H Pneumothorax Needle, for decompression of a tension pneumothorax. You may also wish to include a set of nasopharyngeal airways for airway management. 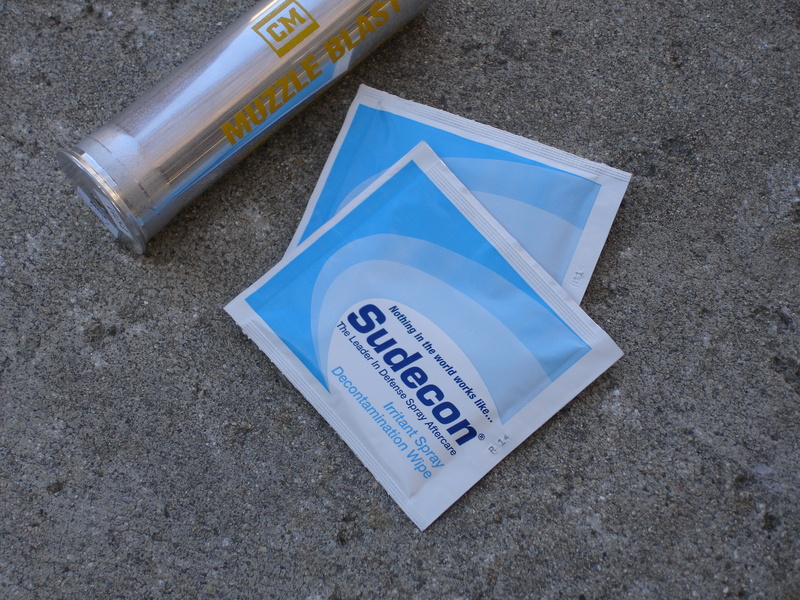 Sudecon Decontamination Wipes are great in the field for chemical agent decontamination. I have an H&H Tactical Combat Care Casualty Card in my IFAK to document patient care. It’s easy to use and saves valuable time. Each card is barcoded for patient ID and comes with a zip tie to attach it to the patient. A Grabber Outdoors SPACE® Emergency Blanket and Grabber Mega Warmer chemical warming pack are included for treating trauma-induced shock. 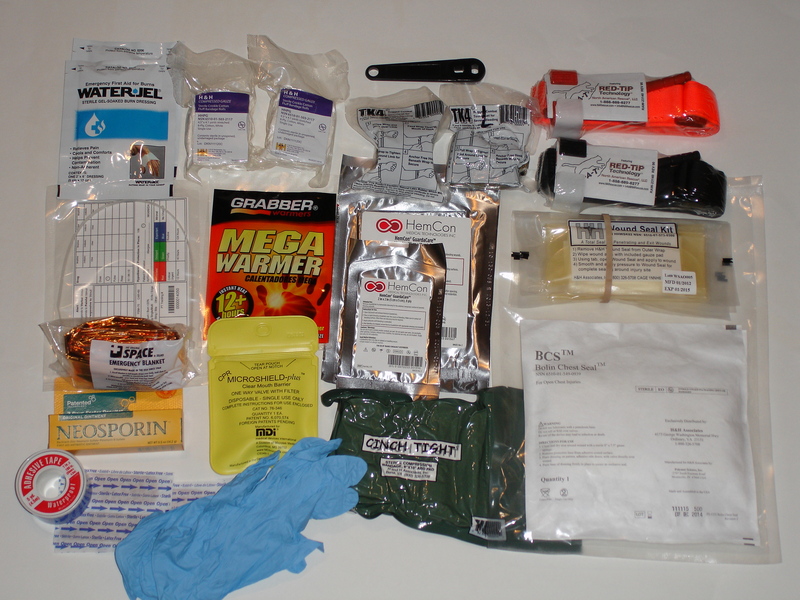 I also keep packets of Water-Jel Technologies Water-Jel® for emergency burn treatment. These items take up little space. Although CPR isn’t practical in care-under-fire situations, I include a MDI Microtek Microshield-Plus® CPR barrier. It provides maximum barrier protection and doesn’t interfere with standard CPR practices. It can be used on both children and adults. Sudecon® Decontamination Wipes are included for OC/CN/CS decontamination in the field where there is no immediate access to water. They contain a patented formula that shortens recovery time from chemical agent exposure. They work better than any other commercial decontamination product I’ve tested. Also included are nitrile exam gloves, an O2 wrench, a roll of one-inch adhesive tape, heavy-duty fabric adhesive bandages, and Neosporin® ointment. 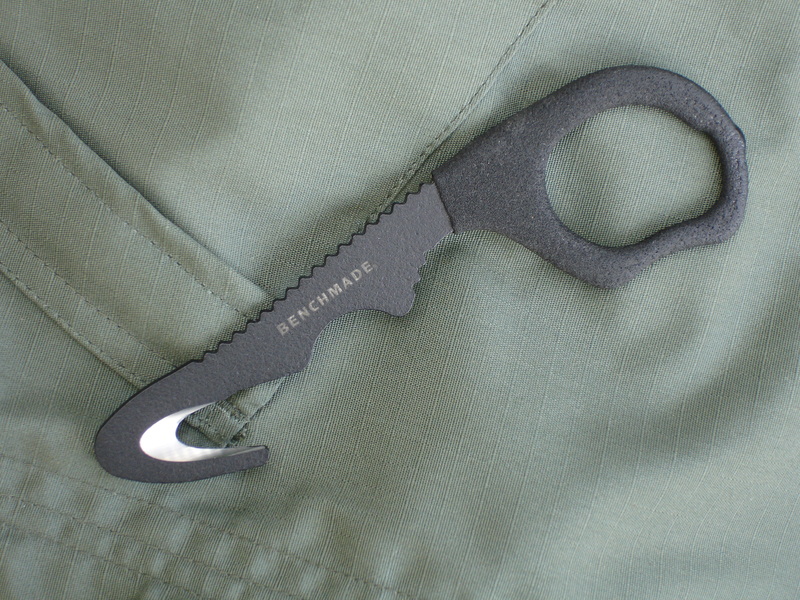 Benchmade 15 Hook/Safety Cutter is designed to cut quickly, reliably and safely in an emergency situation. It’s also great for cutting disposable restraints. Benchmade Knives’ superb new 15 Hook/Safety Cutter has replaced the trauma shears in my kit. Constructed of 440C stainless steel (58-60 HRC) with a black-oxide finish, the 15 Hook combines the best features of Benchmade’s popular 7 and 8 Hooks—a black grit dipped handle with larger opening for gloved hands and added length for leverage and reach. Overall length is 6.10 inches, with a ½-inch blade opening. It comes with a MOLLE-compatible soft sheath. Extra restraints are always handy. Milspec Plastics Cobra Cuffs provide tactical advantages over other disposable restraints. They’re available in a variety of colors. Blue Cobra Cuff is a reusable training cuff. A few extra restraints are always needed. Milspec Plastics Cobra Cuffs® are the only disposable restraints I trust. They’ve proven virtually unbreakable and feature a one-piece design, patented double-locking mechanism, and riveted straps and locking head. Every first responder needs doorstops. 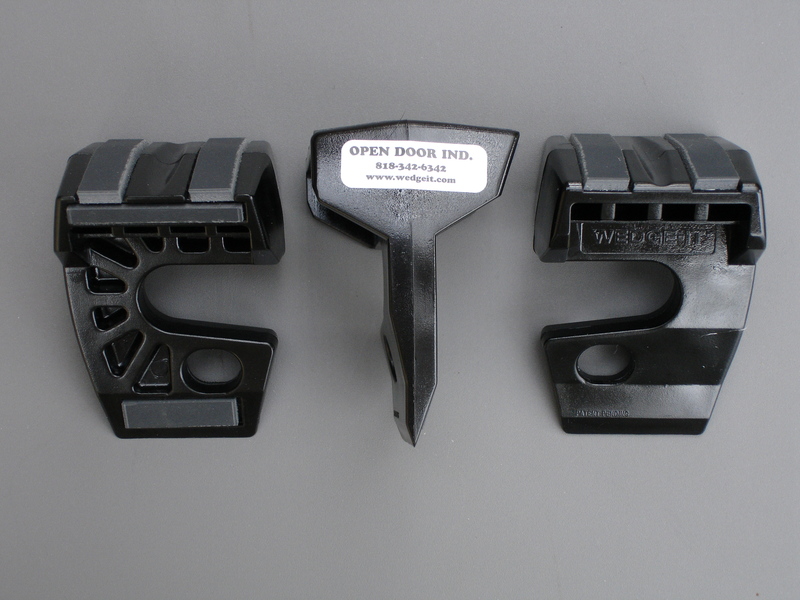 Open Door Industries Wedge-It® three-way doorstops have been adopted by many tactical teams. Designed by a firefighter, they’re made of LEXAN® with ribbed construction with four non-skid polyurethane pads, a notch to fit over hinge-pins, and a hole to assist in carrying. Lightweight and exceptionally versatile, they work on the top of the door, the hinge, the floor, and with pivoting glass doors. Open Door Industries Wedge-It three-way doorstop is widely employed by public safety agencies. It’s virtually unbreakable. Cyalume ChemLights® (CyPad® Markers and Light Sticks) and/or Brite-Strike® APALS™ (All Purpose Adhesive Light Strip) are also musts. They have many tactical applications, including marking cleared buildings at night, marking breaching and link-up points, marking and tracking targets, IFF markers to avoid fratricide, and as an expedient flashlight. APALS and CyPads are newcomers on the tactical scene. 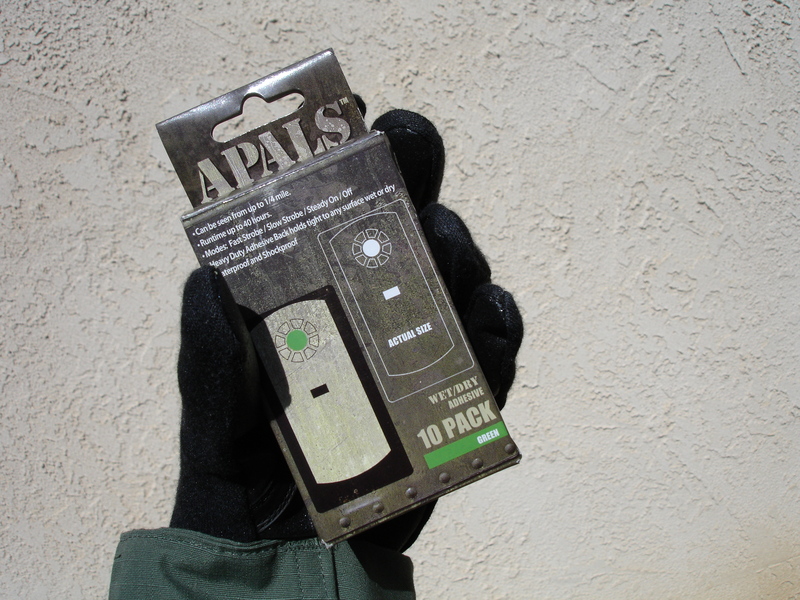 Designed primarily as a disposable combat marker, APALS features a hermetically sealed LED strip, battery and circuitry in a water- and dust-proof package with 3M heavy-duty adhesive on the back. Available in five colors and IR, they have a runtime of 35 to 80 hours, can be seen from 1/4 mile away, and have fast strobe, slow strobe, steady on and off modes. They’re packed in flexible, crushable ten packs to avoid accidental activation. CyPad Markers are flat rectangular adhesive-backed ChemLites and are available in ten-hour visible, eight-hour IR, and three-hour thermal. Brite-Strike APALS has many applications. A ten-pack takes up little space. As the Virginia Tech shooting made clear, every first responder needs a breaching capability. Size and weight are issues. A crash axe/rescue tool, such as the Ontario Knife Company SP16 SPAX, or a high-quality tactical tomahawk, like those from American Tomahawk Company and Benchmade Knives, meets the criteria. Contents of main compartment of author’s go bag. Extra batteries are always carried for the lights, optics and comms being employed. Your needs in terms of a go bag may of course differ from mine. But one thing we all have in common is that the time to prepare a go bag is before we need it. Start to plan and put your go bag together now.